The S.S. Beatrice boasts yacht-style light wood with blue and white finishes throughout, a renovated lobby featuring elegant mirrors, marble floors, a white Murano chandelier with blue shades, and a grand staircase made of nickel and black iron – a signature design element of Uniworld’s Super Ships. The ship’s redesigned lounge features sofas and chairs with hand-made upholstery, a parquet floor and upholstered ceiling panels, solar shades, and new USB ports allowing guests to charge anywhere they are sitting. The artwork throughout the ship includes pieces from Pablo Picasso, Alexander Calder and Pino Signoretto. 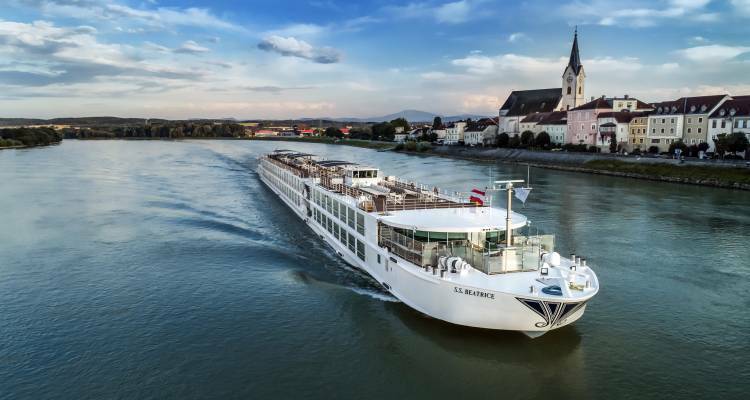 S.S. Beatrice offers four dining options all inspired by famous Austrian composers, including Mozart’s, the ship’s main restaurant; Wolfgang’s bar and lounge and newly added Schubert’s and Max’s. For guests seeking an immersive culinary experience, Max’s restaurant offers intimate cooking classes where guests can create local European cuisines alongside the chef. Schubert’s, an 18-seat café located at the bow of the ship, offers guests shared plates from lunch through dinnertime. The cosy Austrian-styled eatery features menus reflecting the cuisine of the ship’s destinations.